Enlarge Sound from the Socket Description of features: A microphone with a 6.3 mm plug and a sound source, e.g. CD player, tuner, etc. with RCA plugs can be connected to the preamplifier PREAMP-1UP and be adjusted separately via the two front controls. The preamplifier PREAMP-1UP is connected to the power amplifier AMP-1UP. The cabling can be realised via the main lead, i.e. the signals can be fed through from one unit to the other. A max. of 20 power amplifiers AMP-1UP can be connected to one preamplifier PREAMP-1UP. The speakers must be connected to the power amplifier AMP-1UP. Two 8 Ω speakers or one 4 Ω speaker can be operated with one power amplifier. Description of features: A microphone with a 6.3 mm plug and a sound source, e.g. CD player and tuner with RCA plugs, can be connected to the preamplifier PREAMP-1UP and adjusted separately via the two front controls. 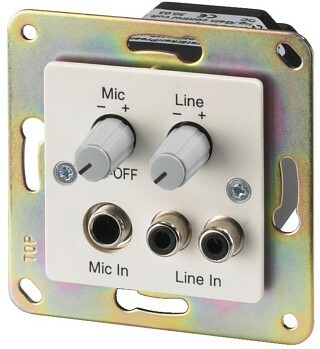 The level control of the microphone also serves as the ON/OFF switch of the preamplifier. If several sound sources are to be reproduced optionally in every room, the hi-fi system has to be connected to the "line" input of the PREAMP-1UP via the "tape out" output of the hi-fi amplifier. Thus, the reproduced sound source in the adjoining rooms is always identical to the one selected at the hi-fi system in the living room. Therefore, the amplifier should always be built-in near the hi-fi system. At greater distances between the sound source or hi-fi system and the preamplifer, it is recommended to use a screened cable for the audio signal. It has to be supplied with 24 V DC current . The preamplifier PREAMP-1UP must be connected to the power amplifier AMP-1UP. The cabling can be realised via the main lead, ie. the signals can be fed through from one unit to the other. A maximum of 20 power amplifiers AMP-1UP can be connected to one preamplifier PREAMP-1UP. Please refer to the basic wiring diagram for the recommendation of cabling. The speakers must be connected to the power amplifier AMP-1UP. Two 8 Ω or one 4 Ω speaker can be operated with one power amplifier. If several speakers are to be connected to one power amplifier AMP-1UP, the signals have to be passed on at each speaker, because the max. cross section for connection of the terminals of the AMP-1UP is 1.0 mm2. A junction box can also be placed. The power amplifiers AMP-1UP must also be supplied with 24 V DC current . The cabling must be arranged radially or a junction box must be placed. The max. cross section for connection of the terminals of the AMP-1UP is 1.5 mm2. Thus, it is only possible to connect one cable at a time.